In the end, economic factors sealed the shuttle's fate. President Nixon's Office of Management & Budget and NASA kept haggling over the price throughout 1971. The White House budget officials were initially sceptical after an August 1969 economic assessment showed the shuttle would barely compete with the existing Titan III rocket in 1980-85 even on a straight dollar-for-dollar basis, without discounting. The accountants estimated the shuttle would save only $0.5 billion over 15 years when the ~$5 billion development cost was factored in. The economic benefits of such an expensive system would become significant only for extremely high flight rates, e.g. $6 billion if the United States had to launch twice as many space payloads as in 1969. This was, of course, precisely what NASA wanted. Although the shuttle thus appeared to be cheaper, the picture changed considerably when discounted dollars were used. The shuttle, after all, would only start to pay off sometime in the 1980s and generally represented a low-priority high-risk investment vs. social programs, military spending and other near-term needs. The budget bureau officials insisted on a 10% discount rate, which erased the entire projected benefit even at the highest activity level of 55 shuttle flights/year. Since NASA only had spent 2.9% of its budget (~$130 million per year) on procurement of expendable launch vehicles in 1964-71 and the US Air Force was expecting to launch bigger but far fewer "Big Bird" spy satellites, the outlook for the shuttle was fairly grim when Tom Paine's ambitious manned lunar/Mars exploration program was axed in 1970. For example, NASA had estimated that the 1975 space station would require 4-8 resupply flights per year. The total operations cost using "Big Gemini" crew capsules would be $1.625 billion over ten years -- $1.145B higher than the cost of using the shuttle. A Rand Corporation study released in October 1970 rejected this view: "the total space funding requirements over the next 20 years are not significantly different for plans that use the shuttle for space transportation and those that accomplish the same missions without the shuttle. All of these results indicate that criteria other than the cost should be used to evaluate the desirability of the space transportation system"
NASA now tried to justify the shuttle by saying it would reduce the cost of satellites and other payloads, since the large volume & payload capacity made it possible to relax constraints of weight and size. This seemed to be very much in-line with President Nixon's message to the nation in March 1970, which stated NASA should "work to reduce substantially the cost of space operations", mainly unmanned scientific and applications missions. It also represented a conscious effort to "win over" space scientists who had contended that the agency was spending too much money on manned spaceflight. 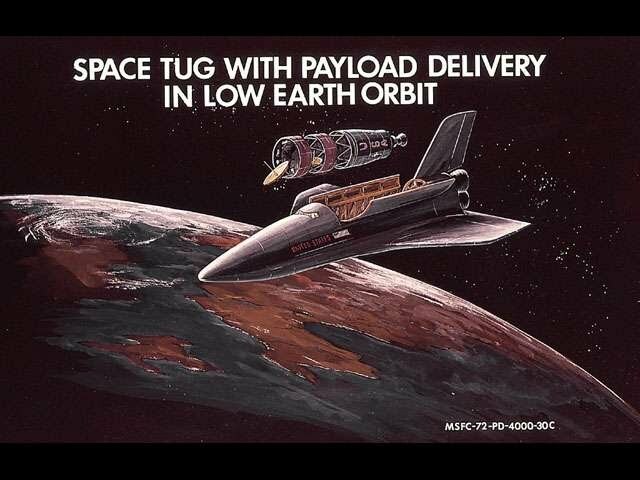 NASA also scaled back its "space tug" program, transforming it into an unmanned reusable upper stage that would move satellites from the shuttle's cargo bay to higher orbits that otherwise would be out of reach. The tug had previously been intended mostly as a space station-based replacement for the manned Apollo Lunar Module, but this mission disappeared in 1970 as the lunar base was postponed indefinitely. The new space tug would be smaller, unmanned and be carried into orbit by the shuttle rather than the previous 6.6-diameter version that would have required a Saturn V launch for deployment. Robert Mayo, Nixon's budget director, requested NASA to conduct a study to determine the payload effects of using the shuttle in March 1970. The work was farmed out to Mathematica Inc. in Princeton, NJ, headed by the brilliant economist Oskar Morgenstern whose 1944 book Theory of Games and Economic Behavior was a landmark in the field of economic decision support analysis. The main engineering inputs to the economic study were provided by the Aerospace Corporation (launch vehicle designs and cost estimates) and Lockheed (payload design and cost esimates) while NASA and the Department of Defense provided projections of their future launch demand. Mathematica's work would turn out to be a key element in all subsequent shuttle decisions, and thus ended up shaping much of the American and European space program in the 1970s and 80s. The results of the Mathematica study were delivered to NASA in May 1971. A previous internal NASA study had identified the fully reusable "Phase B" shuttle+space tug as the most cost-effective option, followed by a new low-cost expendable launch vehicle and existing ELVs in last place. These three alternatives were analyzed by a Mathematica team led by Klaus Heiss. The foundation consisted of the Aerospace Corporation's mission model which in turn was developed from Lockheed's payload data. Lockheed investigated three previously flown spacecraft of large, small and intermediate size and complexity, then redesigned them by imagining that a shuttle had been available. The impact of the increased weight and volume available at reduced cost with the shuttle was then examined, and the cost of refurbishment & repair was also analyzed. The resulting new payloads were specifically designed using modular construction and optimized for low cost, standardization and easy refurbishment rather than optimized for low weight or volume. Lockheed's Max Hunter argued that the time was right for payload standardization: he likened it to the modern automobile industry which evolved from a "you can have any color you want as long as it's black" mentality to highly standardized assembly lines capable of producing cars with a variety of interiors, engines, transmissions, colors etc..
Mathematica found that the "most probable" total cost of developing the Phase B shuttle and flying all 736 missions contained in the 1978-1990 mission model would be $18.314 billion [1970 dollars]. This was considerably more expensive than the $14.893-billion "new ELV" and $14.659-billion "existing ELV" options mainly because the shuttle fleet would cost far more to develop: $12.8 billion. The principal savings would come, surprisingly enough, from reducing the stringent payload specifications required by expendable launch vehicles and not from cheap access to space. Cheaper payload design would have saved $2.4 billion in 1971-90 plus almost $16 billion from reduced payload production & recurring costs (e.g. the ability to repair payloads in orbit or return them to Earth for modernization). This despite the fact that the "payload effects" identified by Lockheed only were applied to 25% of the mission model since the reference spacecraft database was not great enough to permit extrapolation to all projected missions. Overall, Mathematica predicted a total program cost of $44.17 billion in 1971-90 for the shuttle, followed by $54.968 billion for the new ELV and $58.295 billion for current ELVs. None of the alternatives assumed the manned space program would be cancelled, e.g. the "existing ELV" option still included a Titan III-"Big Gemini" option that represented one-fifth of the total launch costs. The shuttle appeared to be the most cost-effective option even if only 500 flights were required, and the basic 736-mission model could support a program costing as much as $18 billion. These assumptions could be regarded as somewhat conservative, since no "price elasticity" was assumed. I.e. the number of payloads would remain constant in the 1980s and the huge cost savings would not pay for additional shuttle flights. No new customers (e.g. commercial users) were assumed. Mathematica specifically pointed out that their analysis was based on a number of flights equal to the unmanned space program of the 1960s, and that the shuttle still would be cost effective. The shuttle's numerous critics were not impressed, however. They pointed out that the analysis amounted to little more than a speculation that rested on another speculation, namely, that the shuttle would be as cheap and work as well as advertised and that payload designers indeed would use its additional capabilities. The Office of Management and Budget pointed out that the mission model contained an average number of 57 flights per year although NASA and USAF only had launched enough payloads for 51 shuttle flights in 1964-69 despite having a far more generous budget. Dr. James van Allen, another prominent shuttle critic, concurred. He pointed out that NASA only launched 18 scientific missions plus 4 manned lunar flights in 1969 with a total payload weight of 173t. In contrast, the Mathematica study assumed there would be one shuttle flight per week delivering about 1179 metric tons of payload into orbit per year... van Allen and other shuttle opponents (e.g. Sen. Walter Mondale and an unfavorable Federation of American Scientists report from July 1971) concluded that NASA was trying to hide a major "make work" manned space program under the basic shuttle traffic assumptions, thereby forcing a substantial increase in its annual budget requirements for the 1980s. Dr. Brian O'Leary (a former NASA astronaut candidate) testified in Congress on July 20 1971, saying that "...one needs to satisfy the rigid weight and volume requirements of the shuttle and to lump diverse payloads together into an orbit of given inclination... In the case of the shuttle and experiment would compete with several others aboard the spacecraft and therefore must be tailored to the needs of the aggregate and of the shuttle launch schedule." This prediction turned out to be eerily accurate. As for the value of maintaining and repairing satellites in space, shuttle critics noted that Mathematica assumed only five astronomy satellites -- Large Stellar Telescope, Large Solar Observatory, Large Radio Observatory, High Energy Astronomical Observatory, High Energy Cosmic Ray Laboratory -- would require the capability. LST, LSO, LRO, HEAO and HECRL only represented 69 deployment and maintenance flights. E.g. a TRW study conducted for the US Air Force concluded that the increasing lifetimes of military satellites (anticipated to be 7-10 years) could make them too obsolete to recover. In retrospect, another fatal flaw was NASA's unwillingness to seriously consider new low cost ELVs as a cheaper alternative to the shuttle. The Mathematica report specifically pointed out that "the study of new expendable concepts has received too little attention. The New Expendable launch vehicle family should be reviewed, redefined and costed for itself, and more thoroughly worked into the overall long term mission/traffic picture than it has been so far. This is particularly important to our Economic Analysis since we utilize an infinite horizon analysis in which potentially radical improvements in expendable vehicles should be allowed for." Mathematica's technical consultant, Preston Layton, concluded that the Aerospace study of such systems had been superficial -- in effect, a "strawman" to be knocked over to show how good the reusable Phase B shuttle was. Curiously enough, the New Expendable option had still managed to finish ahead of the partially reusable shuttle in NASA's 1970 trade studies so the agency did not want Mathematica to analyze any semi-reusable concepts! As late as August 1971, the bulk of NASA's design efforts were still concentrated on the fully reusable two-stage configuration. As a result, there just was not enough time to identify all the details of the new system requested by the Office of Management and Budget, and many of the cost estimates on which NASA had agreed to mortgage its future were based on the sketchiest of preliminary design data. By August 1971, the worst appeared to be over for NASA as the Office of Management and Budget director, Caspar Weinberger, had agreed to keep NASA's budget at the $3.3-3.4 billion from FY 1973 onwards. But there was not much money available for the space shuttle. George Low, the deputy NASA administrator, now felt the most realistic option would be to postpone the shuttle by 5-10 years and instead settle for a small space station plus a manned glider launched on the Titan IIIL. It would be used for space station logistics and resupply, carrying a payload weight of 13,600kg in its 4.57 * 12.2 meter cargo bay. The Nixon Administration was determined to keep the U.S. manned space program going beyond Apollo, there would be some sort of shuttle-like project but there was considerable disagreement about what it should do and how much it should cost. The Office of Management and Budget liked the Titan III/glider plan but proposed to make further cuts: it wanted a smaller spaceplane that would carry only 4,536kg and be launched on the existing Titan IIIM version. The OMB was not convinced that NASA could develop the "Mark I/Mark II" winged S-IC/drop-tank orbiter configuration for $6.5 billion or that it would cost as little as $5.5 million per flight. A highly negative OMB report from October 1971 noted that a 50% cost overrun (=$15 billion in 1972-90) easily would wipe out the undiscounted savings of $11 billion. In the end, it was Mathematica's findings which again tipped the scales that eventually launched the shuttle. The company had received a contract extension when the Phase B fully reusable shuttle was cancelled. Klaus Heiss & co. would now investigate the life-cycle cost of the new alternative partially reusable options that the Phase B prime/double prime contractors were in the process of formulating. NASA was getting desperate and consequently squeezed out a barely justifiable 714 flights during the projected mission model period (1978-90) for Heiss and his team to work with. However, a more conservative "Modified NASA-Department of Defense Baseline Model" only called for 514 flights and Mathematica also analyzed this scenario. In the end, Heiss recommended a partially reusable "Thrust Augmented Orbiter System" (TAOS) since it had the lowest life-cycle cost and development risk. The TAOS concept was basically similar to the old drop-tank Starclipper and ILRV concepts from 1968, but the size (and hence cost-) of the expendable tank & space shuttle main propulsion system would be minimized by strapping on two large recoverable booster rockets that would provide most of the thrust at liftoff. Heiss claimed TAOS would be less risky since no manned flyback booster would have to be developed, and the development cost ($6B or less in 1970 dollars) would be low enough for NASA to develop its "space tug" and low-cost advanced Space Shuttle Main Engines during the 1970s. The Mk I/Mk II phased program would thus be unnecessary, but the TAOS configuration would still preserve the option of a later transition to a reusable booster if additional funding became available in the 1980s. Space Shuttle Development vs. Operations Cost. The "TAOS" options at right (RAO BRB == parallel- burn, twin pressure-few recoverable booster, RAO SRM == parallel-burn, twin solid rocket motors) would cost more per flight but their development cost would be much less than for the fully reusable Phase B shuttle at left or the H-33 configuration. This chart was prepared by Boeing/Grumman, who preferred the series-burn ballistic recoverable booster ("HO BRB") option, or the winged S-IC derived flyback booster option ("H0 FLYBACK") if Congress and the Office of Management & Budget was willing to provide the necessary funding for it. This table summarizes the final results of the Mathematica study, from January 1972. All figures are in undiscounted FY 1970 billions of dollars and the estimates are based on 514 shuttle flights in 1979-1990, including only 13 space station assembly flights in the late 1980s. Some military missions that would be ideally suited for the shuttle were excluded from this "modified baseline" model, although they were part of an alternative model that contained 624 flights. The non-recurring shuttle cost of $7.45 billion included $1.6 billion for the space tug & an additional shuttle launch facility at Vandenberg AFB in California, and $1.5 billion for building a fleet of five shuttles. The "Current Expendable Launch Vehicle" option included $1.5 billion for developing the "Big Gemini" reusable crew capsule & Titan IIIM launch vehicle modifications along with $2.25 billion in recurring operational costs. The "New Expendable " option basically represented an extended Titan III system adopted for both small payloads as well as very large ones -- an "Evolved Expendable Launch Vehicle" of sorts. Mathematica claimed that the TAOS shuttle would "pay for itself" at a social rate of discount of 10% even if the total non-recurring cost turned out to be as high as $10 billion rather than the company estimate of $6.5-8.5 billion. Alternatively, the system would break even if all cost predictions turned out to be accurate but only 25-30 flights per year would be required in the end (=the actual launch demand in the 1980s was, of course, not yet known). Heiss also confidently proclaimed that the TAOS shuttle could be developed without increasing NASA's budget or reducing spending on unmanned space programs. Mathematica also dealt a crucial blow to the Office of Management & Budget's alternative Titan III glider proposal by stating that it would not be cost effective. The OMB Titan III glider would only cost $3 billion to develop but the cost per launch was deemed too high at $30 million. In contrast, the TAOS option would only cost $7-11 million per flight. But the Mathematica analysis still attributed most of the financial savings to payload reusability, and payload design simplification rather than low launch cost. The report did caution that "the interactions between considerations of payload lifetime, reliability, retrieval, refurbishment/updating and reuse with other Space Transportation System aspects are so complex that the ultimate cost savings remain to be shown. While there are strong indications that considerable savings will result, a definitive analysis remains to be performed and although this may not be practicable in the ultimate sense continued efforts will be helpful in realizing the most economical result possible." Shuttle supporters pointed to studies such as Grumman's assessment of the Orbiting Astronomical Observatory which concluded OAO would have cost 63% less to develop and the production cost would have been reduced 34% if the shuttle had been available. But the sceptics countered that Grumman, like Lockheed, had a vested interest in making the shuttle look good since it was a major Phase B contractor. Fletcher now informed Weinberger that he was prepared to reluctantly accept a payload capability of 20,412kg, but he warned that the 4.3 x 13.7m cargo bay would be too small for launching the space tug, many military payloads and some planetary probes. OMB still insisted on a 13,608-kg payload but was now willing to consider a 3.65 x 12.2m payload bay. This would enable the shuttle to use Titan III solid rocket boosters. NASA replied that it required a 20,412kg+ capability to launch Spacelab-type manned modules, space station logistics and many military payloads while most planetary probes and satellite/upper stage payloads would require an envelope greater than 4 x 12.2 meters. The OMB proposal would force the agency to abandon most USAF payloads, all manned payloads, most planetary payloads, and many science & applications payloads. During the New Year weekend, Fletcher learned than Nixon had agreed to approve the shuttle. George Shultz decided to side with NASA despite strong objections from his OMB subordinates; he allowed (after discussing the matter with Mathematica's Oskar Morgenstern) the agency to build the big 29,474-kilogram 18.3 x 4.57m cargo version NASA had wanted. Fletcher and Nixon then announced the birth of the Space Shuttle amid much fanfare in San Clemente, California on January 25, 1972. NASA had won. Nixon's approval of the Space Shuttle can be attributed to several factors. Domestic employment considerations was one of them, since the aerospace industry was in dire straits in late 1971. NASA contractor personnel declined from 394,000 to 144,000 in 1966-71 as the huge Apollo program was cancelled. Military procurement fell from $23.3 billion in '68 to $18.4 billion in '71 and the commercial aviation industry was hit hard by the recession and the cancellation of the Supersonic Transport aircraft (SST). Nixon was worried about this since California and Texas were critical to his reelection campaign, and the shuttle would create 50,000 new jobs. The foreign policy implication was important, since the European aerospace industry was aggressively expanding (e.g. Concorde, Panavia Tornado) into U.S. territory and it was felt the Space Shuttle would enhance the competitiveness of American aerospace companies. The President was also concerned about "declining moral values", the counterculture and hostility towards technology. He did not want to go down as the man who took the U.S. out of manned spaceflight. In retrospect, NASA's perhaps biggest mistake was the agency wasn't primarily interested in the most economical way of conducting the unmanned space program; what it wanted was a manned system capable of meeting virtually all foreseeable NASA, DoD and commercial missions. The Office of Management & Budget never really accepted this view and tried to force NASA to consider smaller and less expensive systems where the manned portion was "decoupled" from the unmanned launch vehicle. E.g. the OMB mini-shuttle would only have had to meet NASA's manned spaceflight requirements while its Titan III-derived booster rocket would have launched all unmanned satellites. The budget bureau always dismissed the shuttle's tangible economic benefits and stated that the important considerations really were confined to national prestige, continuation of the manned space program and advancement of technology (e.g. gaining experience with manned reusable spacecraft). NASA strongly objected, in part because it feared that politicians simply would scale back or outright cancel any shuttle program that was not absolutely essential. It won the debate, but the victory turned out to be a Pyrrhic one as the shuttle now would rise and fall on economics alone. OMB now locked NASA into a bare-bones development budget. The agency's most important space project was going to have to be done on a literal shoestring after Congress made further reductions to the budget in early 1972. There was virtually no margin for error -- for the next nine years.